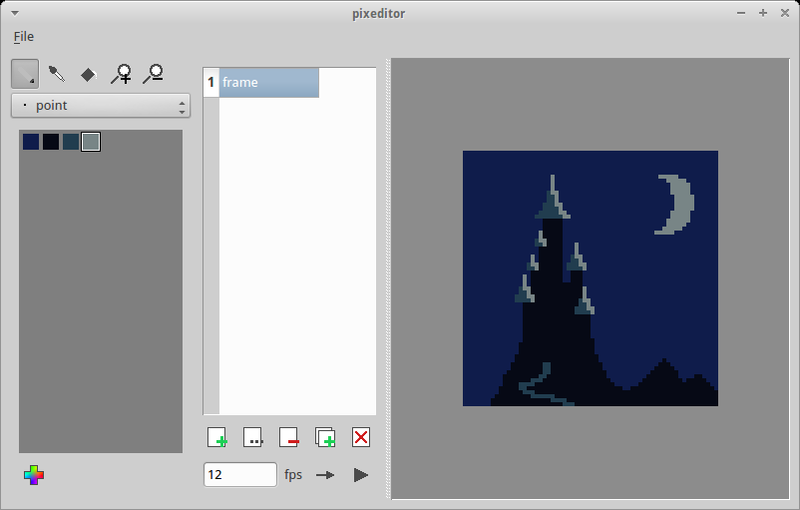 I want to present you a little graphic editor to make animated pixel art I have made last months. This is an very alpha version but it became usable. I didn't test it outside of ubuntu (return are welcome). Use the left and right key to move to previous and next frame. ctrl z and ctrl y to undo, redo, it work only with painting action. I post it now to have some return, you are of course welcome to extend it, or to help me to found a real name. make pixeditor.py executable and run it. Just wanted to say I like the idea of a good animation package for sprites! I'd try to coax a few sentences about what our resident spriters want in an editor, unless you have a lot of experience yourself. Hello ceninan, thank for your feedback. I'd love to see something like this get quite powerful in the future. It could save a lot of headaches for the pixel artist crowd. The big feature I'd want is the resize canvas; I always start too small or large. Maybe I can write a patch or a plugin to add nanim files support? Thank you, I will follow the evolution of your project! Note: do not hesitate to add a screenshot to your github page, it make it more interesting. What are those rectangle in the timeline? they grey rectangles represent the frame duration and you can stretch them with the little white square. I haven't tried it yet as I'm not at home, but the timeline (with frames subordinate to layers) looks very nice. 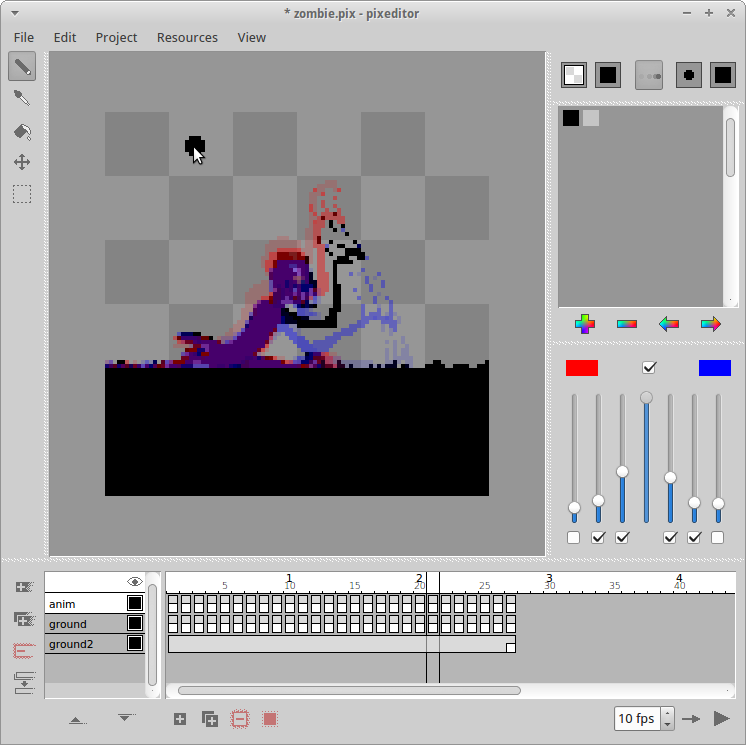 This could be the first pixel editor with (in my opinion) proper animation editing. Now with a full set of pixel editing tools and palette editing tools it could be the mythical holy trinity of pixel editing. Tried it and, yes, this is the way an animation interface should be. Very nice. Red warrior needs caffeine badly. This could be the first pixel editor with (in my opinion) proper animation editing. NIce thing! I'm not good at pixel art, but in my opnion that tool could be very useful for animating. THat looks clear and understandable! I like the windows's scheme. WHat kind of visual theme are you using? is it inclued in your program? Hello Eiyeron, the window's theme I'm using is greybird and no it's not included with the app. I see you're adding onion skin, with that and GIF loading/saving this could already be very usable for EasyToon-style animation. Does PIL properly support animated GIF read and write (a quick web search isn't terribly conclusive)? If so I might have a look at adding GIF support over the weekend (no promises though as I've yet never touched Python). I've just commit about onionskin, it's basic (only the previous and next frame without adjustment) but it work. You're right about PIL only writing 87a. You can output multiple image block images, but they aren't true animated GIF. So, being the fool I am I started writing a GIF reader/writer from the spec, we'll see how that goes (probablly not well). I've improved pixeditor's Python 3 compatibility and created a pull request. So I have added a basic import function. It work only with png with indexed color but you can import them as sequence. Actually, the PNGs don't even need to be indexed; Qt can index RGB images for you. The only drawback is that the resulting color table will always contain 256 colors, even if your image uses less. I've got a prototype for such an importer lying around, and I'll post it once I'm at home. I've implemented importing non-indexed PNG files and created a pull request. I like that you have a palette tool, but it would be nice if each color box took up about 25% less space. (Very slight change, just think it would look better.) 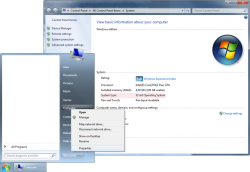 I also think the right-click should be used for erasing so you don't have to change tools. Not sure yet what else could be done outside of improvements you are probably already aware of, like more tools, resizing the canvas, etc. The app is really cool. I would probably use it in the near future if I make any pixel art. it looks fun. If you like my free assets, consider checking out my stream and tipping! Tap: the palette need to be reworked (it can only display 128 color), I will see how it look with less space. I like the idea with right clic, the problem is that the first color can be change, not sure how to make it clear. Maybe just add the possibility to select a second color with right clic. Could you explain how the layers work? What are all those boxes? on the left, you have layers name and the black or white box next to them is the visibility. on the right, you've got time who go to the right, each grey box is a different canvas, so little box duration is one frame, and large box have a longer duration. What's the reasoning behind having a seperate widget for transparency? I see in the code that the transparency is just a palette index (as it should be) so why seperate it from the palette like that? For the transparency, there was some action that imply transparency was color 0 (merge layer, selection, move, erase), the separate widget just make it clear that you can't change it but you still can select it if you have no right clic (tablet). I just try your fork, I better understand your question now. My philosophy when it comes to GUIs is that if the user might reasonably want to configure their interface a certain way and the cost of letting them do so isn't oppressive then one should make efforts to do so. For example: I personally hate having any floats at all but it costs nothing to allow them and disturbingly many people seem to prefer them so why not. Give the drawing context panel a current colour swatch with a pop out palette colour selector (I plan to implement this) and one could hide all other docks and work quite effectively with minimal screen clutter. Ok so why not merge the tool option and drawing option as they appear only depending of the tool. Another things about the toolbar and tool menu: IMO the default toolbar is not a great idea as it take a lot of vertical space, there is allready the timeline who take vertical space. And the tool menu wont be really used, shortcuts is a better option if you want to hide the tool dock. I agree about the toolbar not being great, much less flexible positioning in Qt than with docks and always uses full width/height. I just wanted to use actions and an exclusive action group for the tools and toolbuttons in a dock wasn't working for me as I expected. But I think is was just that I hadn't set the actions to checkable, so should work in a dock. Menus are nice for self documentation: show all the possible actions and shortcuts for those actions. An option for a popup menu (launched from a button or as context menu) instead of menubar would be nice to reclaim a bit more screen space. Working on drag-and-drop palette editing in the vein of GraphicsGale ATM. For the shortcuts, I 'he put them into tooltips. I've just tried it today, it's awesome ! both simple and powerful, good job ! I've got palette drag-and-drop mostly working nicely: LMB drag to swap colours, Shift-LMB to replace colours, Ctrl-LMB to move colours, Ctrl-Shift-LMB to insert new colours. Canvas doesn't update properly when using these yet though and there's a strange bug where the drag-and-drop stops working most of the time when the palette is undocked. I've also added colour slider docks for non-modal colour editing, though they are a bit funky due to error propagation in the RGB/other-colourspace conversion, and replaced the custom colour selection dialog with the Qt standard one, the custom one wasn't working properly for me. About the transparency, I've thought that what would be nice, rather than having one global palette index as transparency, have a configurable index per layer which renders transparent during compositionas well as a configurable global index that is used as transparent in the fully composed image when exporting. This is basically how GraphicsGale does it and doesn't force an extra palette index which can mess up palette layout. I've added the extra entry to the pix file handling, though yet to actually implement any of the funtionality. Also reworked the new project dialog to have a preset size combo. Yup I see you broke lot of thing, I like the drag and drop palette and the color slider but I will wait to integrate them. For the color slider, I think rgb is useless, only computer can understand it. About the custom color selection, what the problem? did you change something? And about the transparency, I dont understand, there are different palette for different layer? It seem really confusing. I really think this is the best option ; first it's simple, qt colortable can have more than 256 color so it's not a problem to add it, palette file doesnt have alpha so it need to be added somewhere and all imported images are processed so it's simple to add it. Is anyone currently developing this (or a fork of it)? 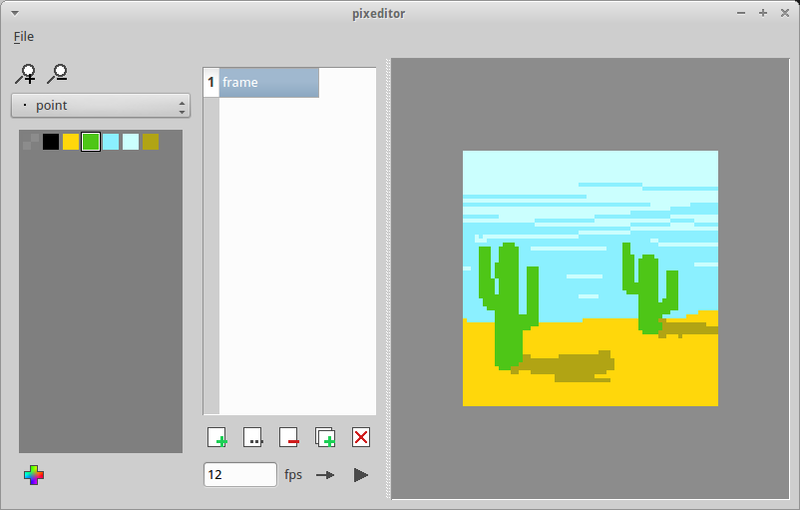 It's a pretty nice tool for pixel art and animation already, but it would be cool to see further development. Edit: Just checked the repo and it looks like it's still in active development. With 1 commit to correct a bug in 4 month, I would not say the development is active. Surt make nice change too, but neither he or I spend time to really integrate them. If someone whant to continue this, I'll be glad to help him. My fork is more broken then not, so I wouldn't recommend working from that. Being morally offended by the broken design of Qt's Graphics View, I started work on an editor (probably for the dozenth time) built around GPU based rendering and image manipulation but that's far from anywhere near usable and I haven't touched it in months.